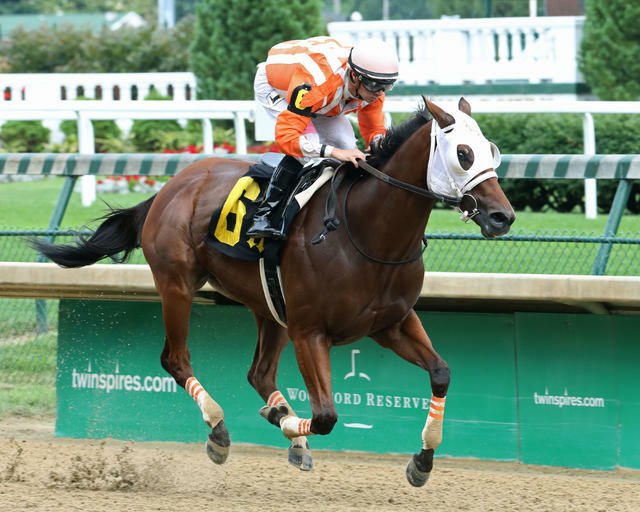 The Top 3 finishers in the June 23, $75,000 Roxelana at Churchill Downs – Astrollinthepark, Miss Kentucky and Vertical Oak – will face each other once again in Saturday’s 10th running of the $100,000 Open Mind beneath the historic Twin Spires. The six-furlong Open Mind for fillies and mares, which drew a field of seven, is scheduled as Race 8 with a post time of 4:21 p.m.
Dreamchaser Thoroughbreds’ Astrollinthepark won the Roxelana for trainer Larry Jones after she pressed the early pace before drawing clear by two lengths under Florent Geroux. In her most recent start, the 4-year-old homebred filly by Divine Park was second in the West Virginia Secretary Stakes at Mountaineer Park. Gabriel Saez has the mount on Astrollinthepark and will break from post seven. Preston Madden’s Miss Kentucky, who has not raced since her two-length defeat in the Roxelana, drew post six with Brian Hernandez Jr. aboard while Kirk and Judy Robison’s Vertical Oak, who most recently finished second in the July 25 Honorable Miss (GII) at Saratoga, drew post position three with Ricardo Santana Jr. in the saddle. The Open Mind field from the rail out (with jockey, trainer and assigned weight): Thirteen Songs (Robby Albarado, Dallas Stewart, 120); P Boo (Jack Gilligan, Kirk Harris, 120); Vertical Oak (Santana, Steve Asmussen, 120); Courtmewithcarats (Sammy Camacho Jr., Clarke Vesty, 120); Our Majesty (Corey Lanerie, Ron Moquett, 120); Miss Kentucky (Hernandez, Rusty Arnold II, 122); Astrollinthepark (Saez, Jones, 120).